Ciara Pettinos ’17 had just filled her grocery basket at Price Chopper when an alarm of a structure fire in downtown Hamilton lit up her phone. “I gave the basket to one of my roommates and ran outside to flag down a car,” said Pettinos, a geology and geography double major from Malvern, Pa. In the parking lot, she hailed a car driven by another Colgate student, for a lift to the Hamilton Fire Department (HFD). The first call to 911 reporting smoke coming from the Lebanon Street building — which houses the Hamilton Movie Theater, noodle shop N13, and Steph Boutique — came through the local emergency dispatch at 6:04 p.m. on February 16. By 6:07 p.m., the first firefighters from HFD were on the scene, ready to tackle what they feared could be a major catastrophe in the village. In total, 22 HFD members would respond. More than half were Colgate students. Strong Colgate student participation wasn’t always the norm at the HFD, according to Lt. William Basher. A handful — already trained members of their home fire departments — had passed through the department in the ’70s and ’80s, he said. “The HFD made them ‘auxiliary members’ — able to participate, but not full-fledged members,” Basher explained. It wasn’t until Avi Berstock ’95, who had no previous firefighting experience, approached the department about becoming a member that the current program was born. Berstock’s request kicked off a contentious debate at the monthly department meeting, but by the time the meeting concluded, his membership was approved. They didn’t know it at the time, but that decision resulted in a pipeline that would eventually funnel more than 150 energetic Colgate student volunteers into the department thus far. Now, the HFD recruits students every year at Colgate’s activities fair. The department’s mock battle with a dorm room, set ablaze in the middle of the academic quad, is now a popular fair mainstay. It’s a way to draw attention to the volunteer program, and has the added benefit of encouraging fire safety. “I don’t think people have a good appreciation of how fast fires can spread,” Fire Chief Jason Murray said. Typically, four to six newcomers sign up following the impressive display. When the alarm for that February downtown fire came in, Tobias Lescht ’16 had just left a weekly Student Senate meeting and was still in a suit and tie. 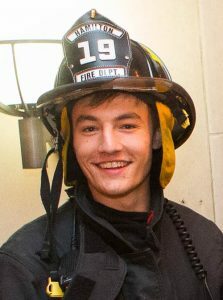 “You get a real kick of adrenaline, and everything else you were thinking of goes out the window,” said Lescht, an economics and psychology double major from Santa Fe, N.M.
Jon Delman ’18, of Mount Kisco, N.Y., was doing biology homework at the fire station when the alarm sounded. The station is a popular quiet spot for student volunteers to study, while having the added benefit of being right there to hop on a truck for emergency calls. Andrew Brodell ’17 was on the phone with a lieutenant from the fire department, talking about getting dinner, when the call came in. 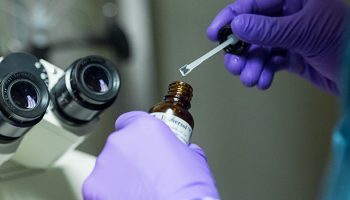 For the molecular biology major from Cleveland, Ohio, the call was one of approximately 600 that he has personally answered in his three years of volunteering with the department. 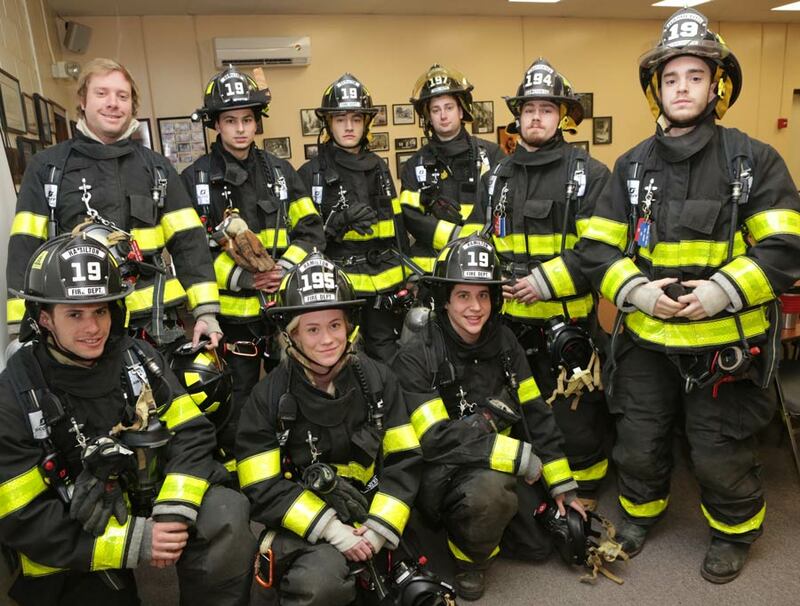 Today, all student volunteers at the HFD are full-fledged members. Their duties aren’t in any way diluted because of the fact that they also have classes to attend. “There’s no separate classification,” Murray said. 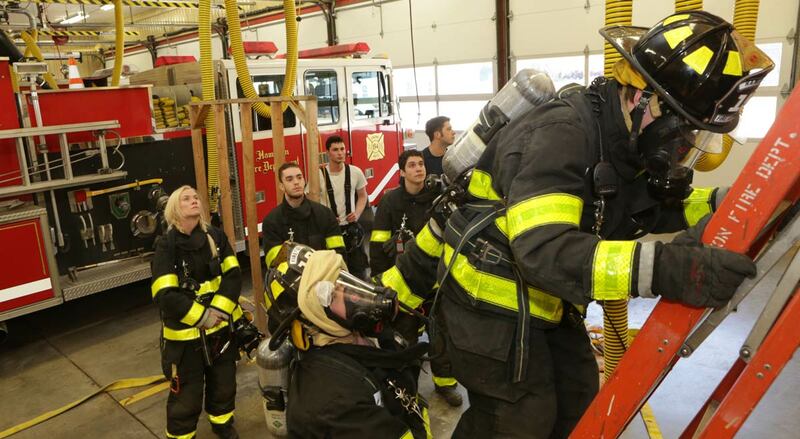 The students are required to take New York State recruit training — the Firefighter 1 class — which is approximately 120 hours long. “Last year, it ran from September to just about Christmas break, and that’s two or three nights a week, as well as pretty much every Saturday,” he added. 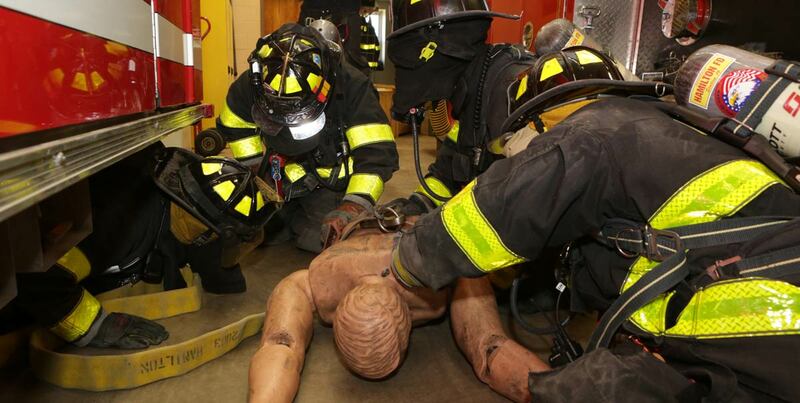 When they complete that class, they are certified as interior firefighters, which allows them to wear the air packs that give the ability to enter burning buildings, and to take on any job a firefighter would be asked to do on the scene: search and rescue, hose operation, ventilation, and cleanup, among others. “It’s up to us to provide the experience and continuing training,” Murray said. Even after waking up at 3 a.m. to rush to a vehicle accident, the volunteers aren’t finished with their responsibilities once a fire is extinguished or the injured are loaded into ambulances. There’s immediate cleanup at the site — glass to be swept, oil to be soaked up, smoke to be cleared with fans. “There’s so much that needs to be done after a fire that people don’t realize,” Basher said, listing everything from pulling down drywall to check for hot spots in walls, to returning to the firehouse to clean hose, repack hundreds of feet of dry hose, wash gear, fill air packs, check batteries, scrub the trucks, and even run a squeegee over the truck bay floor. “That all can take fifteen people two hours to do right after a fire, and it often happens at the most inopportune times,” Basher said. 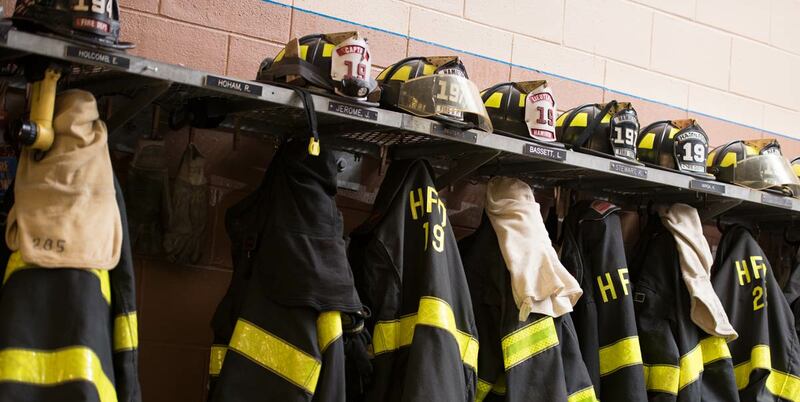 For firefighters, regular apparatus checks are crucial, but they can be onerous. Experiencing that firsthand, HFD volunteer Adam Pratt ’18 teamed up with Alex Montgomery ’11 and Alex Krill ’11 to tackle the problem for fire departments nationwide, using technology and assistance from the Colgate Entrepreneurs Fund. 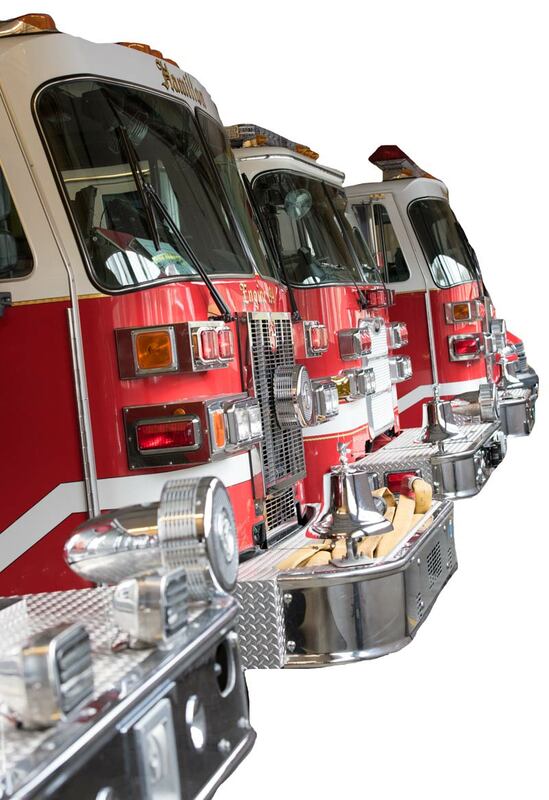 Their product, Halligan, is a simple yet powerful platform built from the ground up to help firefighters perform fast and reliable truck checks. The system features Android and IOS applications that allow its users to perform and upload apparatus checks from their mobile device. Additionally, the platform creates a log of check histories so officers can make smarter, data-driven decisions about repairs and upgrades. Halligan provides better accountability; fire chiefs can monitor the system to ensure that every check was completed on time. Halligan is slated to become a venture in the Thought Into Action program in the fall. Avi Berstock ’95 — the curious student who forever changed the HFD student volunteer model — now works in law enforcement in California. 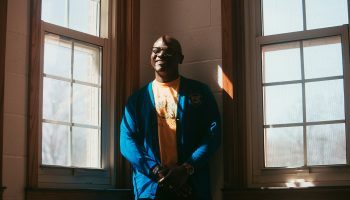 He recalls how, in 1992, he’d been volunteering with the Southern Madison County Volunteer Ambulance Corps (located on Lebanon Street, across from the fire department), when he decided he wanted to expand his repertoire. “[Joining] Hamilton Fire was one of the best decisions I’ve ever made,” he said. 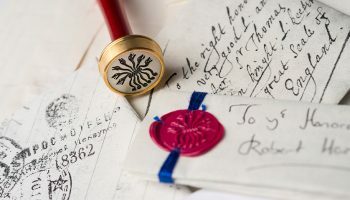 “Even though it was against my father’s best wishes… He worried that I would get hurt and thought I should be spending my time studying,” said Berstock, who graduated with a molecular biology degree. Responding to car wrecks on Rt. 12B North and South were routine, Berstock said, as were calls for emergency medical assistance and the occasional fire. “I remember one call where three kids in a car had collided head on with a milk truck. Two of the people in the car were instantly killed, and one was pinned in the back seat. My friend Brian Martin ’95 and I were the ones operating the jaws of life to open the car up,” Berstock said. They saved that teenager’s life. Martin went on to become a doctor. “The whole crew is scattered amongst the wind,” Berstock said, “but we’ve stayed in contact. That core group of firefighters, twenty years out, still keeps in touch.” To this day, Berstock said, his closest Colgate friends are his fire department compatriots. This past February, when the downtown fire call came in, Peter Coladarci ’18, an economics major from Evanston, Ill., was in his apartment with fellow HFD volunteer Kevin Varga ’16, a geography and geology double major from Moon Township, Pa.
At the scene, Varga and Coladarci — along with Ali Scalzo ’16, a psychology and educational studies double major from Denver, Colo. — searched apartments above the movie theater to ensure everyone was evacuated. Once they knew the building was clear, they pitched in with setting up ventilation to clear out the smoke. “A large part of the reason that I joined the department was to continue to serve after spending time in the military,” said Coladarci, who spent four years on active duty in the Marine Corps before attending Colgate. Adam Pratt ’18, a computer science major from Piedmont, Calif., was in the Drake Hall study room when he heard the call. He rushed to the fire station on foot, and helped with ventilation, lighting, and packing hose. Each fire department has a station number. 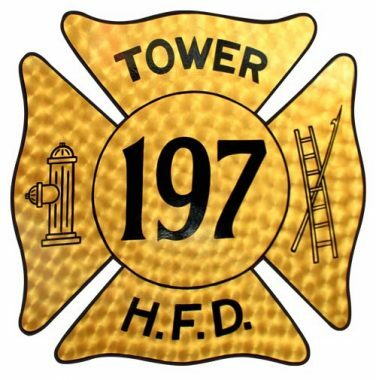 Hamilton is station 19. 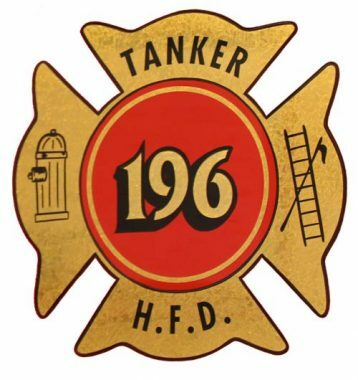 Therefore, when you see someone speak of “194,” that’s the fourth-generation engine [the fourth engine that the department has had] at Station 19. Other trucks sent to the N13 fire call included Rescue 195, Ladder 197, and Small Rescue 195-1. 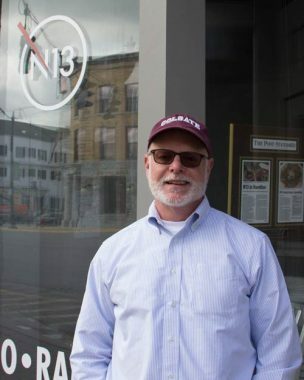 N13 noodle shop co-owner Scott Williams ’80, P’15, ’16, said he was “absolutely floored” with the rapid response from the HFD volunteers. Coincidentally, Williams has a family tie to the HFD that takes the Colgate relationship back more than 60 years: his uncle, Bart Williams ’56, volunteered with the department and later helped establish the current Food for Thought tradition, where parents can order care packages for students, delivered by the fire department during finals week. After learning about the number of students who responded to the emergency call at his business, Williams penned the following letter to campus administrators. Last night we had a small fire in the basement of N13; laundered cleaning rags that still had some chemical residue spontaneously combusted. No injuries, minor damage, none to any of our kitchen space or equipment. 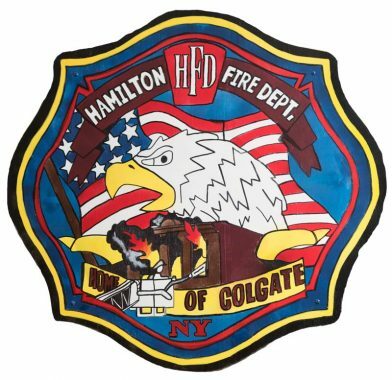 I’m writing you because I just learned that at least 12 Colgate students were part of the volunteer response team from the Hamilton Fire Department. I think that is amazing, and wonderful. It’s unclear to me if you hear about this sort of thing, and while thankfully this was not a major disaster, the fact that Colgate students are so engaged in the community and this kind of civic life I believe is important. 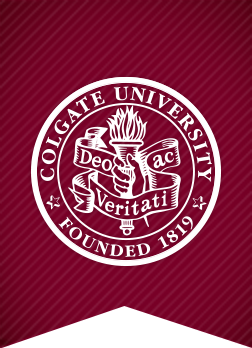 We are going to thank the volunteers who responded with gift certificates to dine at N13, but I did want to send out a note to you about the student involvement, and how proud I am as a merchant and a Colgate alumnus and parent to witness this kind of involvement by Colgate students in the Hamilton community. They will take these experiences with them the rest of their lives. I know the fire department has a special wall recognizing all their Colgate student volunteers over time. It’s a marvelous partnership. Thanks to Colgate, always. Now I have another reason to be grateful for our special place.